Let's take a stroll back down memory lane..... November 3, 2007 to be exact. 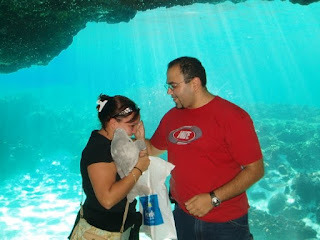 I share with you a story that makes me smile to this day every time I tell it. Enjoy. On this day, I was in Florida on a business trip. 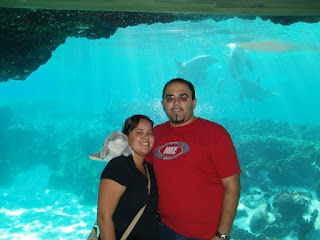 The hubby joined me on this trip because it was in Orlando, FL and we figured we could make a mini trip out of it. I had to work in the morning setting up a booth at a convention center. 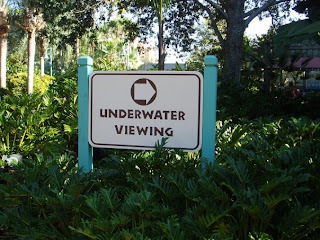 When I was done about midday, I came back to the hotel room and we immediately left for our day at Sea World. We walked around and saw some shows. 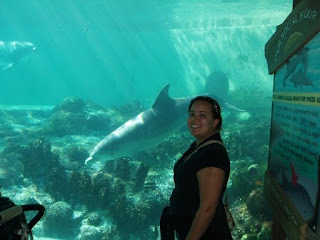 I love dolphins so I was excited after we saw the dolphin show to go check them out during feeding time and in the underwater viewing area. 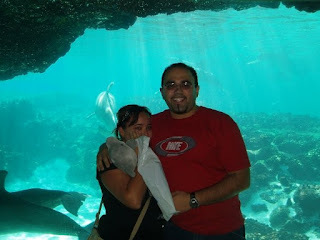 I was having so much fun feeding the dolphins. 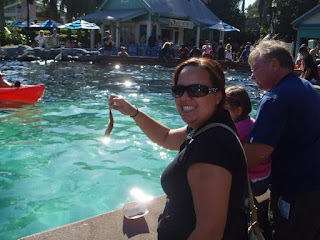 Please note, I was not a fan of holding the slimy little fish in my hand. 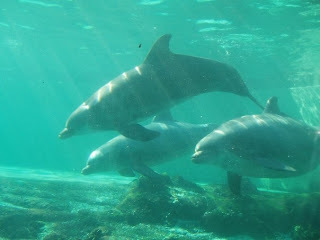 It was so great to see the dolphins swimming around so up close and personal. I was as happy as can be. 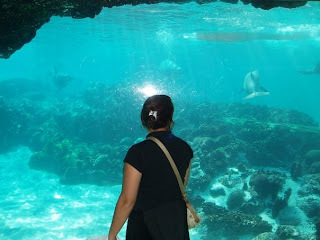 We then decided to go to the underwater viewing area so we can watch the dolphins swim around and play. The hubby took some shots of me as I was oozing with excitement. 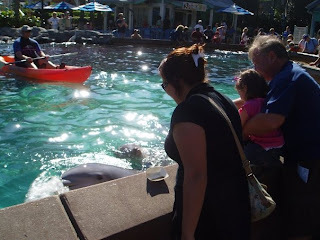 He knew how happy dolphins made me and I was so engrossed in the dolphins swimming that I barely noticed anything going on around me. 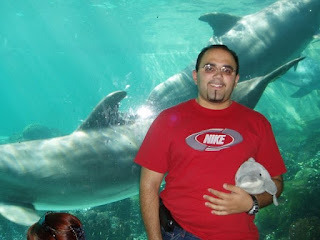 Who doesn't think these dolphins are beautiful creatures? 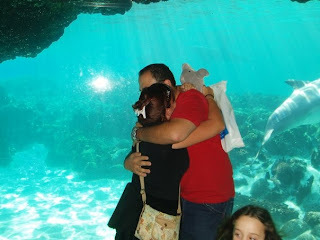 Hubby was so concerned with having someone take pictures of the both of us. When I mean concerned, he was really concerned. So at first we decided to take snapshots of each other while we he scouted out for a person to take pictures of us. Then a really nice gentlemen was able to take a picture of the both of us. 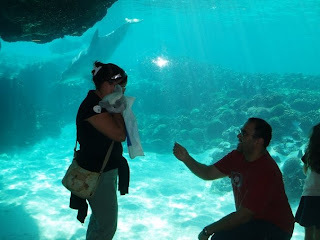 Of course I said yes and was totally amazed and we couldn't even get a good picture of us because I kept moving like a little kid because I had no idea what to do with myself! I cried, but I cried tears of happinness. It was a day that I will never forget because it was completely unexpected and it was perfect. Perfect for us. 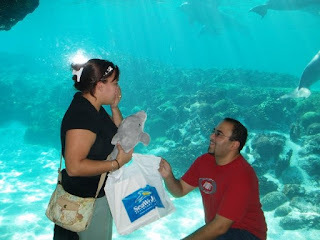 And that is our proposal story. Today, we are getting ready to plunge into 2010! I hope you enjoyed this little stroll down my memory lane. I know I sure did. 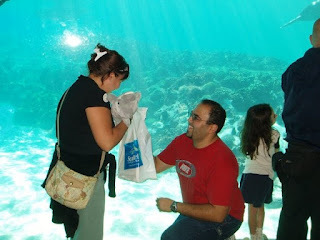 What is your proposal story? Come on, you know you want to share it with me! Going to flip a sh*t! Who said there are brownies?!? !